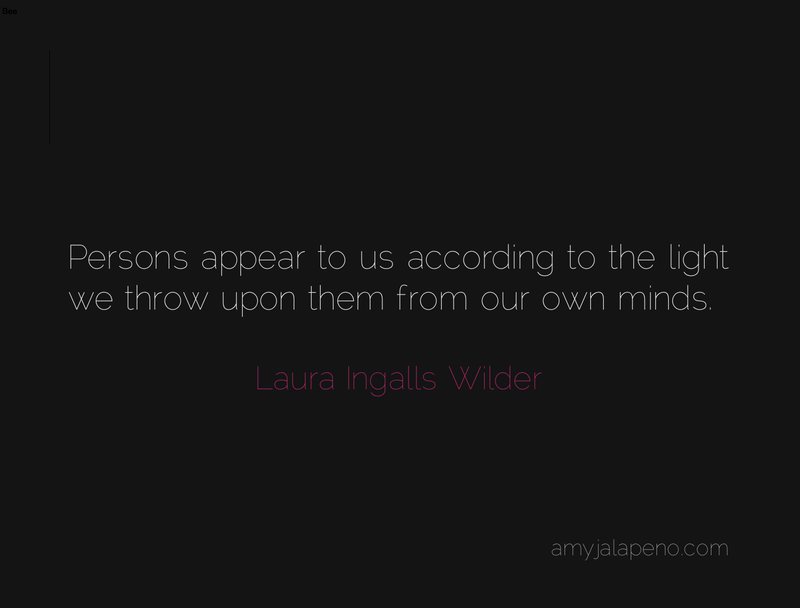 perception + laura ingalls wilder (daily hot! quote) – AmyJalapeño! blog. Ti capita mai di esegue in qualsiasi browser web problemi di compatibilità? a risolvere questo problema problema? Grazie! Ho incorrere in problemi di formattazione minori che erano facilmente regolabile. Non so di troppe persone che usano Explorer (soprattutto Firefox, Chrome e Safari). Io preferirei il tema WordPress ho scelto di essere un po ‘più dinamico, ma è stato relativamente stabile. Thank you! I have run into minor formatting issues that were easily adjustable. I don’t know of too many people using Explorer (mostly Firefox, Chrome, and Safari). I would prefer the WordPress theme I picked to be a bit more dynamic, but it has been relatively stable. That is the exact reason why I post images (with me listed as the author and my url) instead of just text. I also make sure each image is named with key tag words (no more than four or five, although I have broken this rule a few times) so that they are easily searchable, which happens to be the main source of traffic to my sight – search engines – more so than any other social media. аnd I սsed to gο to seе tɦіs webpage daily. blog. I bookmarked it to my bookmark site list and will be checking back soon. Take a look at my website too and let me know your opinion. and I to find it very bothersome to inform the reality however I will certainly come again again. Thank you, Opal. I run each quote through the WordPress spelling and grammar check before I post. I suppose some spelling errors could have slipped through. That said, when I post quotes from others, I post them exactly as I read them from the book I took them. I will not assume to correct the work of others when it was published that way. As far as my own words, I have tried to catch everything, but I have a very busy life outside this blog and I am human. If you decide to stop by again (and if it is not too much trouble), please shoot me a private note on the “contact me” page with the date of the quote, so that I can immediately fix the error if you see one. I am continually striving to improve this website and greatly appreciate your feedback. ne le гegrette paѕ ! !